Who is a "natural born citizen" of the United States? The one thing that characterizes both arguments is an ignorance of the law concerning citizenship. The Constitution specifies that a president must be a "natural born citizen" of the United States, but it does not define the term. The Supreme Court has never clarified the issue, but there is a law, 8 U.S. Code 1401, that spells out in detail who is a citizen. The law uses the phrase "citizens of the United States at birth" and lists categories of people who fit that description. First, there are people born inside the United States. No question about that; their citizenship is established by the 14th Amendment. Then there are the people who are born outside the United States to parents who are both American citizens, provided one of them has lived in the U.S. for any period of time. And then there are the people who are born outside the United States to one parent who is a U.S. citizen and the other who is an alien, provided the citizen parent lived in the United States or its possessions for at least five years, at least two of them after age 14. Since they are all "citizens of the United States at birth," the question is, does that also mean they are "natural born citizens" in the constitutional sense? "My conclusion would be that if you are a citizen as a consequence of your birth, that's a natural-born citizen," says Theodore Olson, the former Bush solicitor general who defended John McCain in a 2008 lawsuit alleging McCain was ineligible to be president. McCain was born in the Panama Canal Zone in 1936 while his father served in the U.S. Navy there. Even though the area was under American jurisdiction and both McCain's parents were U.S. citizens, some Democrats alleged McCain was ineligible to be president. McCain won the case, if not the presidency. The law is really quite lenient, especially for those born outside the United States. If a child were born today in, say, Kenya, to a Kenyan father and an American citizen mother who had lived in the United States for at least five years, at least two of them over the age of 14 -- that child would be a "citizen of the United States by birth" and be eligible for the White House. But what about Rubio? What about a child born in the United States to noncitizen parents? "I am not aware of anyone who has contended that someone could be born in the United States and be a citizen by virtue of the 14th Amendment and nevertheless still not be a natural-born American citizen," says Washington lawyer Matthew McGill, who worked with Olson on the McCain case and did extensive research into the law and history of citizenship. "If he is born in the United States, his parentage is not of consequence." But some do contend that Rubio is not eligible for the presidency. (The eligibility requirement for vice president is the same as president.) "Rubio is, quite simply, not a 'natural born citizen' by the accepted legal, English-language standard as it has been known throughout American history," wrote WorldNetDaily founder and editor Joseph Farah in February. "He was born in Florida to two non-U.S. citizen parents." But according to the law, Rubio is a "citizen at birth," and the most reasonable reading of the law and the Constitution is that an American is a natural-born citizen if he or she is a citizen at birth. There might be complaints about that in coming months, but that's the way it is. Rereading this is starting to make my stomach hurt. Observes Hermann. Not me, though. He discusses his view of the magnitude of the cash-pile that German savers and investors are sitting on. 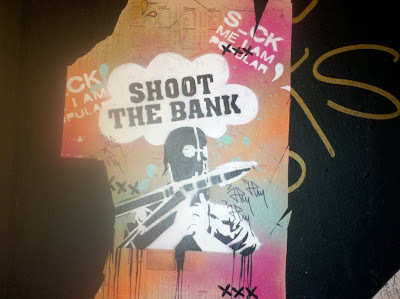 While this is in sharp contrast to the state of personal finance south of the Alps, that's still alright by me. the punch line is that they seem to have invested most of it at those awful horrible dreadful banks they like to despise so much (they make big banks even bigger, you might say). Investments in real estate haven’t even been calculated here, by the way. One of the pressing problems with all economies, even the German economy, is that a large amount of money has been pulled out of markets, and has still not gone back in. This starves companies that hire, build plant, or otherwise invest, of operating capital. One certainty is that when the fear DOES go away, stock prices (and volumes) will rapidly rise in a large, one-time Oklahoma-landrush style event. After all there has been an awful lot of money worldwide that has been held back since 2009 despite the enthusiastic chatter about emerging markets and notions of Chinese economic infallibility. People have watched their retirement accounts fall and eke back something, but are likely exactly where they were 4 years ago. There's anxiety about this having cost/lost time in the scale of years that they will have to keep working beyond the age that they had once anticipated. Before you discount this is a bad way of looking at what the German investor MIGHT do, make a note of their taciturn ways that define the Sparkultur that makes them look like “the 1%”. It always adopts behavior practiced abroad for some length of time as a part of sticking with what’s tried and true, even if it’s goofy. Going “all in” on solar panels at a northern latitude where the sun might shine for a few days every other August is a sign of this. The shared-delusion makes perfect sense to them because they keep hearing that people out there in the big, wide world think it matters, so it must be the thing a schlauer Kopf needs to do – and do it Sofort, once it is recognized. So it isn’t quite mad to think that sooner or later, they’ll be making large withdrawals from the 1st National Bank of Sealy Posturepedic at some point in the cycle we see now. It might foretell a trend which is also true of all of the OECD societies – more popularly among those that are emerging from recession in reasonable shape than the rest, but a likely trend across the board in an effort by the great mass of individual to (if nothing else,) get personal retirement plans back on track without the rest of society’s ideas. Europeans being “forced” to retire at 68-70? Forget the Social contract as a discussion point - the economy has made that decision for us. This holds true despite the knuckleheads frequently found marching in the streets of French cities on a seasonal basis trying to circumvent the plain fact that there just isn’t enough money to provide for all their comforts on the backs of the taxpayers whom they outnumber by "making a debate" out of it. 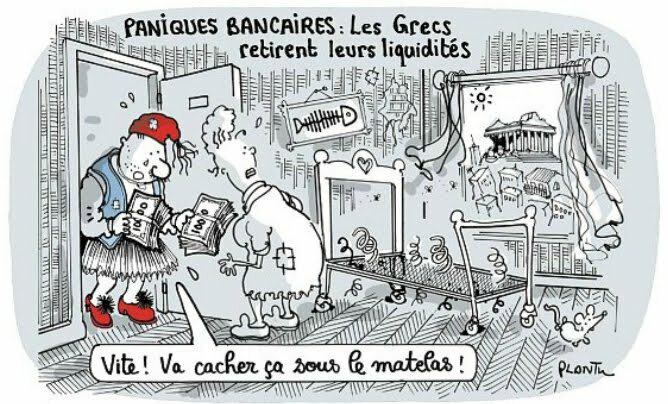 Title: "A run on the banks: Greeks gather together their liquid assets"
Stereotypical Greek man: "... Quick!, hide this under the mattress!" Brett Kimberlin's Modus Operandi Was Described in Jonah Goldberg's "Liberal Fascism"
That is how the liberal Gleichschaltung works; contrary voices are regulated, barred, banned when possible, mocked and marginalized when not. Progressive voices are encouraged, lionized, amplified — in the name of "diversity," or "liberation," or "unity," and, most of all, "progress." Incidentally, it seems like we only have photos of Brett Kimberlin as he looked at the time of his terrorism activities and his time in jail. Don't we have any recent, current photos of what he looks like in this day and age? Or is that also something that nobody has a right to post? An environmental “eco-district" built on "brownfield" land on the French side of the border with Switzerland 15 klicks from Genera aims to attract wealthy and indingnantly green Swissies. More than 1000 people will be able to move into the low-energy apartments, which have green roofs and photovoltaic panels. The city will include a pedestrian town square and a “green corridor,” of walkways, planted with 750 trees. Price per square meter: 4000 euros, which is very reasonable. There will be a percentage of social housing as well. The sad fact is that it will displace the people who live there: occasionally productive lower income folks who actually materially do something for a living, and therefore commit the sin of sometimes consuming fuel. “There’s a race for housing, which is a source of imbalance, both socially and ecologically,” Claude Barbier concludes. So the modest and picturesque peasants may stay, so long as they move into the allotted percentage of “social housing”. How very empowering. 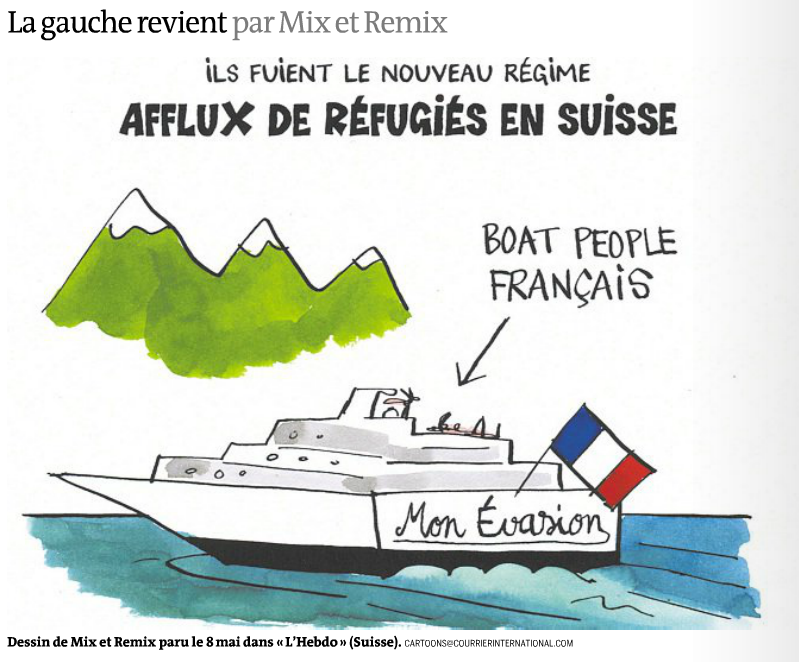 Boat People: What Does the French Version Look Like? Obama Delighted to Meet France's Socialist Leader, Who Vows to Support BHO "For as Long as Possible"
According to Le Monde's Corine Lesnes and Thomas Wieder, Barack Obama is delighted to find in François Hollande a man of similar outlooks, with Hillary Clinton explaining the two leftist presidents were spending "a marvelous moment together during a marvelous day" (translated back from the French). France's socialist president "is even bringing hardly-disguised support to Barack Obama" for the November elections — not to Mitt Romney nor to the United States proper — as he expresses his hope that their partnership "will last long" and that his meetings with the One will continue "to last the longest time possible". As for Iran, "Barack Obama has reason to be satisifed" as Hollande's foreign policy is closer to Obama's weak soft approach than to Nicolas Sarkozy's "backbone of steel." …the path ahead [regarding Afghanistan] is far from certain. As if to underscore the problems remaining, new French President Francois Hollande skipped Mr. Obama’s remarks at Monday’s session, arriving to take his seat only after Mr. Obama had finished speaking. 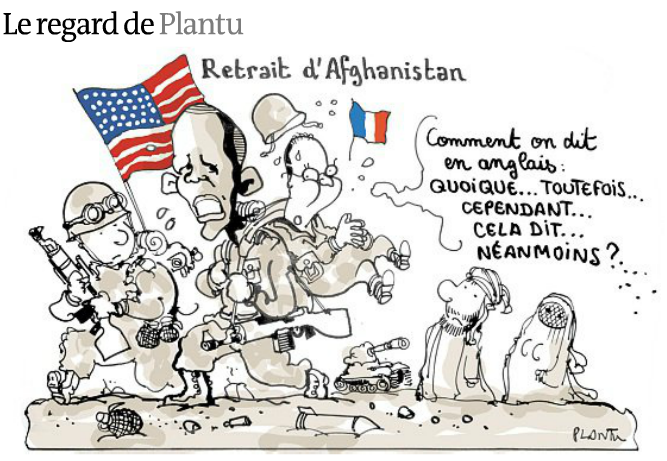 Mr. Hollande campaigned on a pledge to remove France’s 3,400 troops from Afghanistan by the end of this year, and he has publicly resisted efforts by Mr. Obama to reconsider his vow. But of course, such things hardly matter when the really important issues in this day and age — for the White House, for the nation, for the entire planet — concern… getting Barack Obama reelected to a second term. … tout était fait pour que les quelques journalistes qui avaient eu le privilège d'approcher la petite troupe croient Mme Clinton sur parole quand elle leur expliqua qu'ils passaient ensemble un "moment merveilleux dans une journée merveilleuse". En assistant à ce spectacle, et en apprenant que François Hollande s'était vu proposer de dormir à Blair House dès le jeudi soir (mais il avait préféré arriver aux Etats-Unis le vendredi matin), on se posait une question : Barack Obama ne cherche-t-il pas à se rattraper après avoir affiché son soutien à Nicolas Sarkozy pendant la campagne présidentielle ? "La Maison Blanche reconnaît l'importance du président de la France et des problèmes mondiaux qui sont devant nous", rectifie un officiel américain. De son côté, François Hollande a indiqué qu'il comprenait que les chefs d'Etat parlent plutôt aux chefs d'Etat qu'aux candidats. … le président français a même apporté un soutien à peine déguisé à Barack Obama, qui a pour horizon la présidentielle de novembre. Dans le bureau Ovale, quand il a souhaité que leurs rencontres se poursuivent "le plus longtemps possible". Et devant les Français, quand il a dit : "Nous avons engagé un partenariat avec le président Obama qui, je l'espère pour lui, et pour nous, durera longtemps." Sur le fond, l'heure était à l'affichage des points d'accord. En matière économique, d'abord. Concernant la situation de la zone euro, le président français a ainsi souligné qu'ils ont "la même conviction que la Grèce doit rester dans la zone euro". Plus largement, "la croissance doit être une priorité, en même temps que nous mettons en ordre nos comptes publics à travers des pactes budgétaires", a déclaré François Hollande, en se félicitant que, "sur cette dimension de croissance, le président Obama a pu marquer une convergence". Même si les propos sont restés assez généraux, il était important, pour M. Hollande, qu'ils fussent prononcés : le chef de l'Etat peut se prévaloir d'avoir un allié de poids dans sa condamnation des politiques d'austérité, ce qui lui donne un atout à la veille du marathon diplomatique qui doit l'amener à proposer à ses partenaires européens la "renégociation" du traité de discipline budgétaire. Dans le domaine stratégique, les deux hommes ont également pris acte d'un point d'accord important. Il concerne l'Iran. François Hollande a donné sa position : "Que la négociation puisse s'engager mais avec la fermeté indispensable pour qu'il n'y ait à aucun moment l'accès de l'Iran à la technologie nucléaire à des fins militaires." Barack Obama a des raisons d'être satisfait : à l'égard de Téhéran, le nouveau chef de l'Etat français est davantage sur sa ligne que ne l'était Nicolas Sarkozy, qui est pleuré chez les conservateurs, désolés d'avoir perdu "la colonne vertébrale en acier" des grandes puissances qui négocient avec l'Iran. 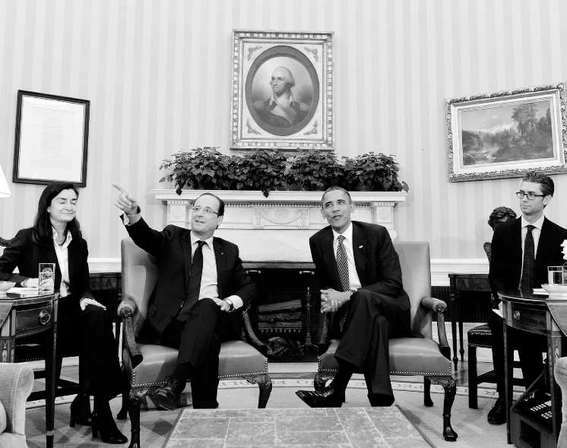 • François Hollande: How do you say in English the words however… although… nevertheless… having said that… notwithstanding? Some of which live in a past held in some sentimental regard by people who can’t count past 21. This is particularly true of European Syndicalists and Socialists, such as propping up dead industries to pay back those who voted for you, such as steelmaking for that old-fashioned “butch men in cloth caps” feeling of haing a “Great Leap Forward”. 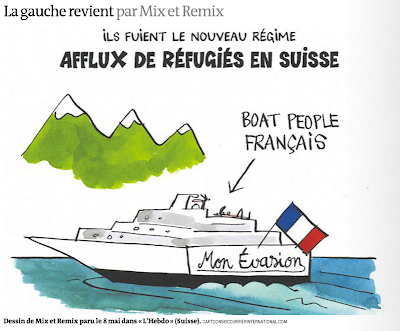 They include ideas to make them sound modern like looking serious about the economy by starting a new ministry, such as a ministre du Redressement productif, which translated roughly as ”Ministry of Production Recovery”. Not only is the idea that the government can spoonfeed prosperity to a thankful lumpenproletariat idiotic and impossible, but the name of this new little sub-empire makes no sense in any language. This doesn’t seem to bother people who want to look like they are doing something, especially what they really don’t have anything in their ideological toolbox that will work. Any informed person’s first thought is to want to ask: “what austerity?”, but you have to remember that we’re talking about the true black helicopter crowd. By this, I mean Germans doing generally better than virtually anyone else on earth that isn’t standing on a desert full of oil protesting the very existence of financial system, thinking that nanny’s teat could still provide after its’ post-revolutionary elimination. Uh, wait — except, no, they are not sympathizers of the Tea Party movement, in any way; rather, they are members of the far left, who sound amazingly like sympathizers of the Occupy Wall Street movement. 3) expressed a wish to (do nothing else but) "become visible to imprisoned people"
4) claim to fight against poor housing conditions, personal data collection by the police, and the defense of undocumented aliens. Le procès de six militants d'ultragauche renvoyés pour "actes terroristes" se tient, depuis le 14 mai, à la dixième chambre correctionnelle du tribunal de Paris. C'est le premier procès relatif à ce que les services de police et de renseignements ont commencé à appeler, à partir de 2007, la "mouvance anarcho-autonome". Une mouvance à laquelle le groupe de Tarnac - interpellé en 2008 pour des sabotages sur des lignes SNCF - a, plus tard, été rattaché. Les six militants qui comparaissent libres, après avoir tous fait plusieurs mois de détention préventive, sont, eux, soupçonnés d'avoir fabriqué ou détenu des produits explosifs. Il est en particulier reproché à trois d'entre eux d'avoir été associés à la fabrication d'une bombe artisanale retrouvée avec la trace de leur ADN, le 2 mai 2007, sous une dépanneuse devant un commissariat de Paris. Agés de 29 à 31 ans, les six prévenus se sont tous présentés comme sans profession ou en formation et bénéficiaires du revenu de solidarité active (RSA). Plusieurs ont indiqué avoir fait des études supérieures en ethnologie, biologie ou sciences politiques. Deux d'entre eux ont expliqué avoir été admis en classe préparatoire scientifique avant de lâcher leurs études. A la barre, ils ont également parlé de leur engagement "anticapitaliste" mais ont réfuté l'étiquette d'"anarcho-autonomes". L'essentiel de leurs luttes, ont-ils décrit, tourne autour des causes de la lutte contre le mal-logement, le fichage policier ou de la défense des étrangers sans-papiers. C'est d'ailleurs à l'occasion d'une manifestation devant le centre de rétention administrative de Vincennes (Val-de-Marne), en janvier 2008, que le dossier judiciaire les concernant a été ouvert. A l'époque, trois d'entre eux sont interpellés à proximité du centre de rétention avec, dans des sacs à dos, des produits chimiques pouvant entrer dans la composition d'explosifs. A la barre, Yvan H. et Bruno L. notamment, se sont défendus de telles intentions en indiquant que ces produits étaient simplement destinés à la fabrication de "fumigènes". "On voulait être visibles des gens enfermés", ont-ils plaidé.